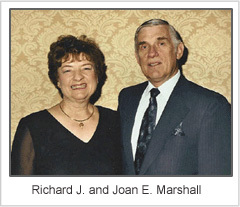 The R.J. Marshall Company was founded by Richard J. and Joan E. Marshall in May of 1978. Originally conceived as a manufacturer representative company, R.J. Marshall sold commodity grade industrial raw materials. Soon, they found a way to offer a solution to the inconsistent quality of materials drawn from individual mines: a better way to achieve the best possible properties from batch to batch. This kind of consistency and quality has been the hallmark of the R.J. Marshall reputation even today. Offering a broad base of products to both the cast polymer and composites markets as well as the wire and cable industry, R.J. Marshall with its flame retardant and smoke suppressant division; Marshall Additive Technologies, and its subsidiary; Marshall Gruber Company, can service a full range of solutions to manufacturers for a variety of applications. For more information about available products for your needs, please see our Products & Applications page. To be a world leader providing specialty, industrial raw materials and manufacturing supplies; being directed by our core values, quality policy and focused on our mission. At The R.J. Marshall Company we seek to make our customers successful by supplying innovative, quality focused products and services. We serve our customer’s needs with perseverance and create an environment where our customers, employees and suppliers are highly valued. highest quality materials and services. Use statistical methods to understand and manage the actions of our total organization. Dedicate ourselves to continuous improvement in all activities of our business. Continually strive to develop our employees through training and education. Quality will be achieved through prevention of defects rather than detection. Integrity – to maintain the highest ethical standards. Honesty – to be honorable and trustworthy, to always do the right thing. Respect – to show regard for worth, honor and esteem for our employees, customers and suppliers. Perseverance – to have a passion for excellence and a resolve for continuous improvement. our employees to solve problems. Forgiveness – to create an environment of trust where people are allowed to fail. Fairness – to treat all people in a just and equitable manner. Competence – to do it right the first time by making smart, quick, common sense decisions. Family – to recognize and support the family and maintain a family atmosphere.